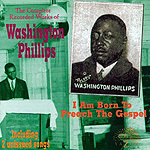 CD review: "I Am Born to Preach The Gospel"
A low-key, if passionate, Christian preacher and singer, Washington Philips' greatest claim to fame may be that he is only one of two artists ever to be recorded playing the dolceola. A cross between a piano and a zither, a dolceola was manufactured in Toledo, Ohio, at the turn of the 20th Century. This compilation by Yazoo Records includes every song Philips ever recorded, and all were laid down between 1927 and 1929. Apparently, little is known of him other than what is found in these recordings. While the dolceola, with its shimmering sound, gives these historic recordings a surreal sound, it is nevertheless Philips' voice that most grabs your attention. Rough and gravelly with limited range, his vocals still have a sense of power and purpose. The subject matter is almost entirely biblical, and what isn't is firmly Christian. While definitely blues-influenced, this is closer to country folk music than gospel or blues. Taken from 78rpm discs, the recording quality here is uneven. This album is likely to appeal most to very serious music collectors and instrument freaks who want to hear a dolceola.